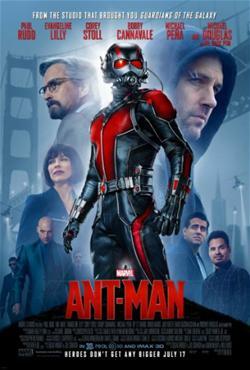 SYNOPSIS: Armed with a super-suit and the ability to shrink in scale but increase in strength, con-man Scott Lang must embrace his inner hero and help his mentor, Dr. Hank Pym, pull off a heist that will save the world. REVIEW: When I first heard that Paul Rudd was playing Ant-Man, it was tough to imagine him in the role. I mostly think of him in lighter fare like “This Is 40″ and “Anchorman 2,” but his casting really works for “Ant-Man.” As the Marvel superhero, he manages to be funny, touching, resourceful, brave and romantic. That’s a tall order for such a (sometimes) tiny character. In “Ant-Man,” Rudd plays Scott Lang, an accomplished burglar who’s just been released from San Quentin prison. He’s determined to clean up his act, but good jobs for ex-cons are hard to come by, and his ex-wife wants child support for their young daughter. After Scott gets fired from Baskin-Robbins, he agrees to go in on a heist with his former cell-mate, Luis (Michael Peña), and two other pals to rob a rich old man’s safe. What he doesn’t realize is that the target is Dr. Hank Pym (Michael Douglas), who set up the robbery in order to recruit Scott as the new Ant-Man – a superhero who can shrink down to the size of an ant and also communicate with insects to make them do his bidding. How handy would that be?! Hank and his skeptical daughter, Hope (a nearly unrecognizable Evangeline Lilly, who honestly, looks like the twin of Bryce Dallas Howard’s character in “Jurassic World”), want Scott to help them keep the nefarious Dr. Darren Cross (Corey Stoll) from perfecting his own Ant-Man-like suit, which he hopes to sell as a military weapon to the highest bidder. Ant-Man is giving Iron Man some competition as the funniest superhero in the Marvel Universe. Rudd is charming and a natural when it comes to quippy one-liners and sarcasm, especially in his scenes with the also very funny Peña as Scott’s prison BFF. We also have a strong heroine in Hope, who like her “Jurassic World” twin (see above) is strong and brave and gunning to put on her own super-powered insect suit. Stoll is great at playing the egomaniacal villain you love to hate, and Douglas’ Pym is a worthy mentor for Scott. I love their friendly father-son type banter. All the dialogue in this movie is great. In summary, “Ant-Man” is a fun installment in the Marvel franchise, and hopefully there will be more Ant-Man movies to further connect him with the other Avengers. As with every Marvel movie, stay through the end credits. Violence/Gore: Sci-fi/action and violence throughout. A villain uses a gun that kills people (and sheep, in some cases) and reduces them to red goo. People are shot at and bruised after fist fights. A villain grabs a child, but she’s not hurt. Drugs/Alcohol: Adults drink beer, wine and champagne socially. Which Kids Will Like It? Kids aged 12 and older who like the Marvel movies or comic books. Will Grownups Like It? “Ant-Man” is fun and clever, with great sci-fi action.